Tribune Chronicle / Bob Coupland Dr. Lance Grahn, dean of Kent State University at Trumbull, will retire July 1 after having served the past four years at the post. 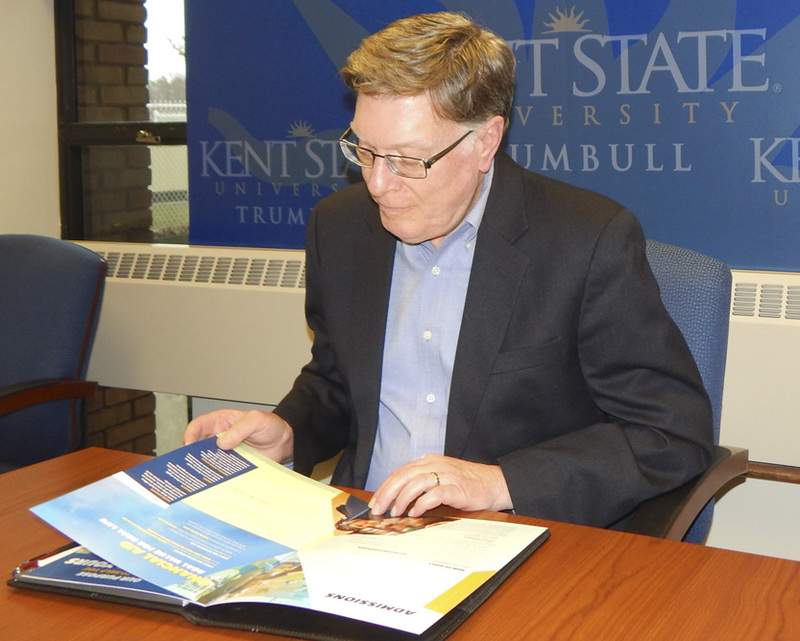 CHAMPION — As he prepares for his retirement July 1, Dr. Lance Grahn said he is most proud of the connection Kent State University at Trumbull has been able to make with the local community and organizations. Grahn, of Bazetta, who has served as dean at the Trumbull campus for the past four years, said he remembers when he began at KSU in 2015. His first public event was a reception hosted by Anthony Cafaro Sr. for the Youngstown Warren Regional Chamber at the Mahoning Valley Scrappers game at Eastwood Field in Niles. “The Cafaro Company, and specifically Anthony Cafaro Sr., welcomed me and my wife, Dianne, to the community. I still have the photograph of all of us,” Grahn said. He said he and his wife were soon out in the community going to the Howland Farmers Market and other locations. “I soon learned quickly in the years I have been here that if you meet someone, you will see them again at Giant Eagle,” Grahn said. He said what he wanted to do as the new dean of the campus was reconnect and focus on community engagement. He said his involvement started with the Alliance for Substance Abuse Prevention. “ASAP was the first local organization that I got actively involved with,” he said. “That happened very quickly as I heard the lament of unfilled job opportunities in the Valley. I learned the primary reason people weren’t getting hired was they could not pass the drug test. Grahn said with the campus’ nursing and psychology departments and student organizations, the university got involved with the addiction crisis in the area and helped make the Warren community stronger. He said the university also became involved with the Trumbull Career and Technical Center’s Adult Education program to help displaced General Motors workers. TCTC has used space at the campus for robotics and other programs offered to students. “We were seeing changes when the second and third shifts were eliminated. Everyone has responded at their own strength with the needed transitional training. It is all of us working together — Eastern Gateway, YSU, Job and Family Services and TCTC,” Grahn said. He said the job-training initiative includes not just GM workers, but also people who lost jobs when Sears and Kmart closed. “That sense of ongoing dislocation has become our new normal and a new economic social reality,” Grahn said. He said Kent-Trumbull has had to adapt to that new reality by converting space at the campus that was formerly used for one type of skills training into needed state-of-the-art training, such as nursing labs. “This shows life is not a constant. The steel mills are not what they were more than 20 years ago. There are new careers and job programs starting that we must make space for,” he said. For his remaining months as dean, Grahn said he is looking forward to his last graduation ceremony in May. He said the university has had many great commencement speakers, including car dealer Diane Sauer and U.S. Rep. Timothy J. Ryan. Grahn said he is proud of the university’s partnership with the Tribune Chronicle for community events. “It was a positive step for us to partner with the Tribune Chronicle on the Scripps Spelling Bee, Twenty Under 20 and the Pearl Harbor Day programs. I am so glad that Kent-Trumbull has had that partnership for the good of Warren,” he said. Charles Jarvis, publisher of the Tribune Chronicle, said Grahn “brought a new energy to Kent Trumbull. “He reached out to us very early and we decided to partner with him and Kent-Trumbull on various projects. The greatness of his time here will long be remembered. He has done a lot for the campus and the community,” Jarvis said. After retiring, Grahn said he plans to stay engaged in the community by remaining on the board of United Way of Trumbull County, the Trumbull County Historical Society and the Complete Count Census Committee for 2020. “I meant it when I said at the Community Stars banquet that Warren is now home. Our friends are here; our church is here. We have no reason to leave. I will be active in Trumbull County,” said Grahn, who is a Colorado native. He attended college in Texas, did post-graduate work at North Carolina and Michigan, and held jobs in Virginia, Alabama, as dean of the College of Letters and Science in Wisconsin and as vice president of academic affairs in Arkansas. “Coming back to Ohio has been coming back to the Midwest,” he said.